To download and install LabVIEW follow National Instrument’s instructions. While installing the device drivers, make sure the VISA driver is included. If you forget to install the VISA driver, you can download and install it here. The easiest way to install the LabVIEW drivers is by downloading the .vip file located in their VIPM link. The driver project can be found at this link driver project. Download the vipm file from VIPM link. Once the zip file containing the vipm is downloaded click on the up arrow and select show in folder. Then right click on the file and select extract all. Open the newly created folder called chemyx-syringe-pump-lib-0.0.0.14.vip. Then double click on the file called chemyx_lib_syringe_pump-0.0.0.14.vip. This will automatically run JKI VI Package Manager (VIPM). Another option would be to open VIPM and select File->Open Package File(s) and browse to the download .vip file. VIPM is installed automatically with LabVIEW. If you do not have VIPM installed the .vip file icon will not look like , but instead have the default windows icon. If you double click on the file windows will ask you to select the the application to open the file with. VIPM can be installed for free from http://jki.net/vipm/download. After either selecting or double clicking the vip file, VIPM will open a dialogue window showing the package information. Verify the product information corresponds to the syringe pump driver. 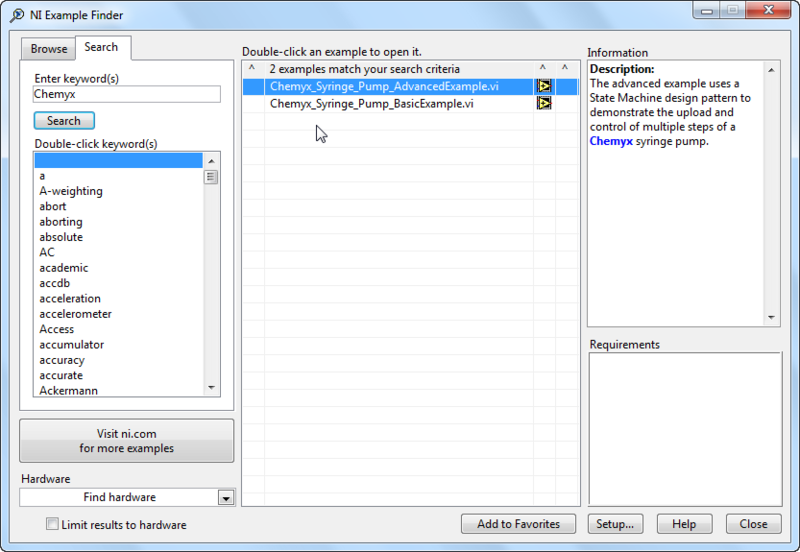 Make sure that the LabVIEW version where you want the driver to be installed is selected from the drop down menu. If you have multiple LabVIEW versions VIPM will have the last version you installed a .vip file selected at startup. You can install drivers into multiple versions of LabVIEW, but you have to do this one at a time. So once this installation is complete you can switch the LabVIEW version in VIPM and install the driver again. Remember this driver is supported by LabVIEW 2015 or later. The package will install if LabVIEW is already open on your computer, however you have to make sure all modal windows are closed or the installation will not complete until they are. 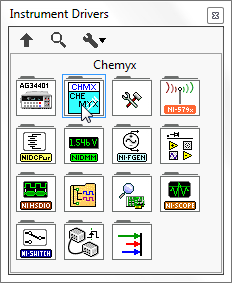 After the package is installed you can find the driver in your palette under Instrument I/O -> Instrument Drivers -> Chemyx. This palette contains the VIs needed to control the syringe pump. Two example VIs have also been installed. 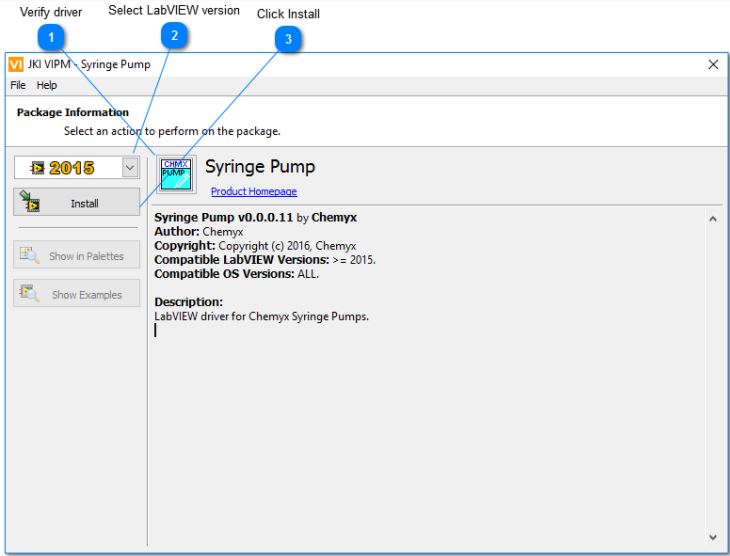 They can be located …\LabVIEW20xx\examples\Chemyx\Syringe Pump\Chemyx_Syringe_Pump_BasicExample.vi or found through the Find Example by searching for Chemyx.